Robert, Sandi and Michael are here visiting and we went out driving and drove up through Griffith Park to the observatory where we saw this painting on the wall and and I saw Jupiter through the telescope with all its moons. On the left, a symbolic figure of the Wind grasps a sundial and compass. Calm is shown to the right, holding a modern sextant. The moon orbits diagrammaticall around the two figures. At the top is an astrolabe, an early astronomical instrument. 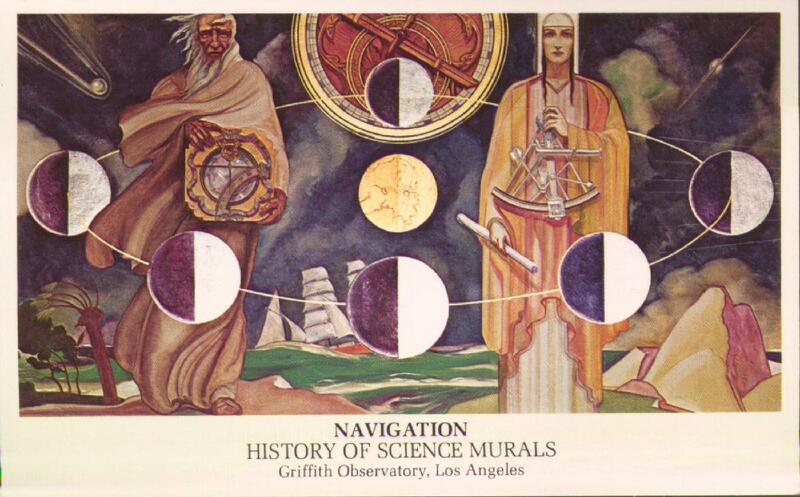 I was recently going through the originals of these postcards and decided to see exactly how much of this Griffith Observatory mural was represented. What I found was pretty amazing. There are eight Hugo Ballin murals in the rotunda, plus a ceiling painting. 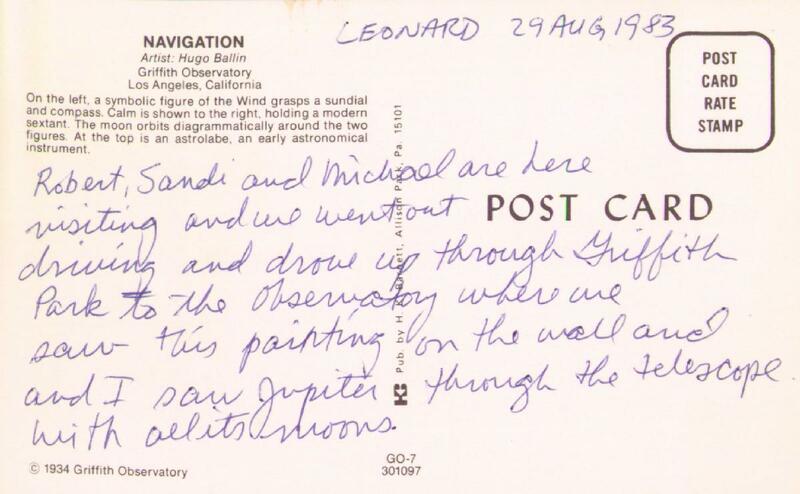 Over the course of seven visits to the Griffith Observaty between February and October 1983, my dad bought postcards of all eight murals. Starting in August, he was buying two copies of each postcard: one for himself and one for me. In January 1984 we visited again, and since we already had all eight postcards he bought me another "Time" (my favorite because of the gruesome execution of the magicians) and he bought himself a postcard of the ceiling painting. So for several months my dad just remembered which murals he'd bought postcards of, and avoided buying duplicates. I couldn't keep it straight while writing this, with all the postcards in front of me. Wow.